If you were born during or around the 70’s or just a pop culture fan, you’re certainly going to remember this house. This is the place where Dylan, Brandon, Brenda and the rest of them hung out for the summer. It also was a big turning point in the popularity of the show from what we’ve read as the show went from pretty tame to a bit racier when they hit the beach. The home is actually located at 3500 The Strand in Hermosa Beach and is the very last home before the Strand takes a short push east and sits right on the border of Manhattan Beach and Hermosa. It’s certainly not the only famous home in town but it’s one of the more recognizable. 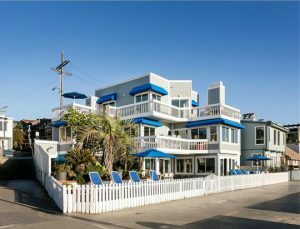 We’re not quite sure how the 90210 crowd had it laid out, but it’s actually a triplex and given the unique location it fronts the beach on two sides. All of this nostalgia and fame (more likely an extremely unique location for a future home) can be yours for a cool $16,500,000. Contact us for more information.